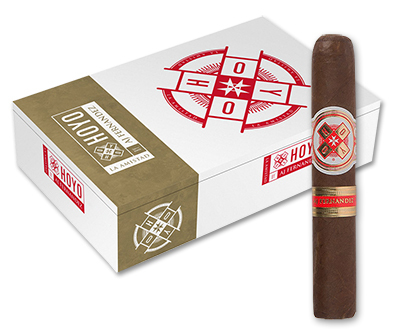 The storied Hoyo de Monterrey brand steps it up a notch with Hoyo La Amistad, a collaboration between cigar maker A.J. Fernandez and General Cigar Company. A.J. grew up near the Hoyo farm in Cuba and has a special attachment to the brand, which is why he poured his heart and soul into the blend's creation, and it has certainly captured the hearts of cigar smokers who appreciate a full-bodied, spicy cigar. La Amistad, which means "friendship" in Spanish, is rolled in A.J. 's Tabacalera Fernandez S.A factory in Nicaragua with binder and filler tobaccos from Nicaragua's top growing regions covered in a toothy Ecuadorian Habano wrapper. These premium cigars share notes of leather, pepper, espresso, and cocoa, with baking spices and nuttiness on the finish. The La Amistad is a great cigar to leisurely enjoy after a nice meal.